As more and more research reveals that the negative, long-term neurological effects of playing football begin in childhood, there’s been a growing chorus of concerned doctors, former players and activist parents calling for children to stop playing tackle football altogether. Now they’re being joined by a state legislator who wants to turn such a restriction into law. Last week, State Rep. Carol Sente introduced a bill to the Illinois General Assembly proposing a ban on tackle football for anyone under 12 years of age. Sente, a Democrat in the far northern Chicago suburbs, was joined by a handful of concussion awareness advocates, including former Chicago Bear and sportscaster Mike Adamle and Tregg Duerson, son of Dave Duerson, the Bears player who infamously committed suicide in 2011 and was subsequently found to have chronic traumatic encephalopathy (or CTE), a degenerative brain disease caused by repetitive head trauma and common in football players. I recently spoke with Sente about the bill; its chances for passage; and what it’s like proposing a ban on tackle football while representing a district that’s crazy about football. What inspired you to put forth this legislation? My work on this actually started six years ago. I have a constituent who’s a neurologist and who wanted legislation limiting the amount of tackling in youth football practices. I told him, “I’m never going to be able to pass that.” I know how people feel when the government tries to tell them what to do. But my constituent kept feeding me the concussion research. And as I read all the data, all the articles and all the books, I realized my constituent was right: Concussions in football rises to the level of a public health issue, and I have to do something about it. So in 2013, I introduced a bill to limit the amount of full-speed tackling at the youth level. But I couldn’t get it out of committee. The issue of concussions in football was still too new. It wasn’t that new, though. The first instance of football-related CTE was discovered in 2002, and there’s been a steady amount of research done since then. True, but legislation lags behind culture. And people just love football. They thought, Why are you trying to take away my football? Did you propose any other legislative measures? I came back the following year and successfully passed a bill that required all Illinois high school sports coaches and athletic directors to pass an online certification course about proper concussion protocol — a certification that have to retake every two years. But this new legislation is about preventing children from suffering impacts in the first place. I hear parents say, “My kid has never had a concussion; it’s not a problem.” But not exactly. Concussions are like smoking. One cigarette doesn’t give you cancer. But smoking three packs a day is going to drastically increase your chances. Why do this with legislation? The idea of the government infringing on something as sacred as football is sure to upset people. The big reason we need to do it via legislation is youth football doesn’t have a national organization — like, say, the U.S. Soccer Federation — that governs all of youth football. The U.S. Soccer Federation, has banned headers for all players younger than 11. And USA Hockey has banned body checking for players under age 13. There’s USA Football, but they get their funding from the NFL, and the NFL doesn’t want people to stop playing tackle football and ruin their pipeline of players and fans. Legislation, on the other hand, can definitely make the sport safer. We want to delay a child from playing until they have some musculature in their neck and can better sustain head impacts, and the coating in their brain is more fully developed to protect their nerve cells when they get these subconcussive hits. I have a personal reason, too. I lost a sister at 23. She got in a car accident and wasn’t wearing her seatbelt. We didn’t like seatbelts at the time; they were an inconvenience. But if the seatbelt law had been in place, she would’ve worn one, and she would’ve lived. You put the age cutoff at 12 years. I have to imagine that’s because of the recent Boston University study that finds playing football before age 12 increases the likelihood of brain damage later in life. Yes, but that’s only one part of this. There’s lots of public support for this legislation as well. A recent study from the Center of Public Opinion at the University of Massachusetts-Lowell finds that nearly 80 percent of respondents think kids younger than 14 shouldn’t be playing tackle football. What’s been the reception to your legislation? It’s a polarizing topic. There are staunch proponents, staunch opponents and a middle group who says, “I don’t know about this. Tell me more.” I did, though, have one former youth football coach from Oswego, Illinois, a big football town, tell me he pulled his child from football because the game is too dangerous. I hear stories like that all the time. So the tide is shifting on this issue? Even some opponents agree with us in spirit. The Chicago Tribune editorial board has said children shouldn’t play football, but that that decision should be determined by parents, not lawmakers. Where then is the opposition coming from? There have been some parents who have said, “Whether my son plays football is my decision.” Or, “Football is my son’s life. Without it, what will they have?” I always tell them, they’ll still have flag football. Some people think I want to take away football permanently, but that’s not my goal. 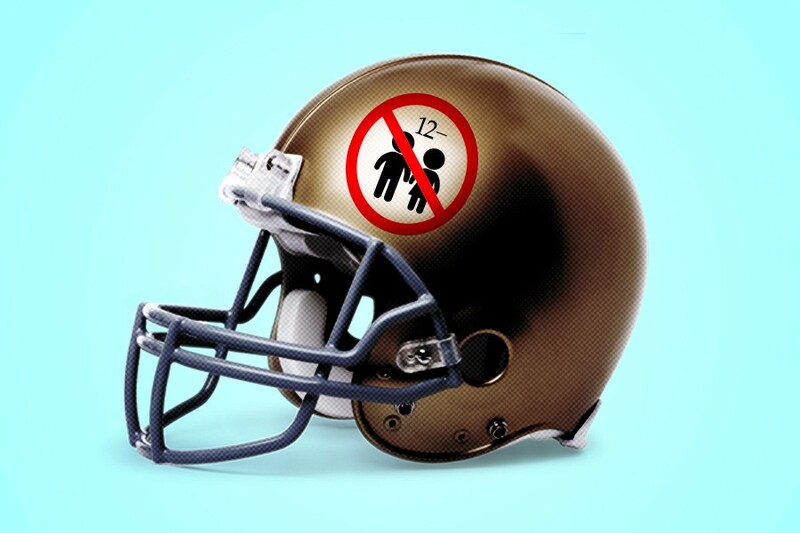 In fact, this legislation will help save football, because it will make football safer.